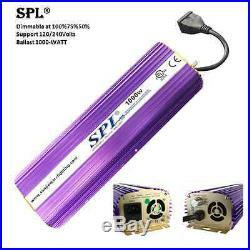 SPL® 400w 600w 1000w watt HPS MH Grow Light System - Umbrella Horizontal. Our flawless ratings, feedbacks and praises are not just vouches of excellence but returning customers, ranging from single-light to hundred-light setups, time after time. Choice of the following Ballast. 400W Digital Dimmable Electronic Ballast. 600W Digital Dimmable Electronic Ballast. 1000W Digital Dimmable Electronic Ballast. Choice of the following Super HPS / MH Bulbs combos of the corresponding ballast wattage. 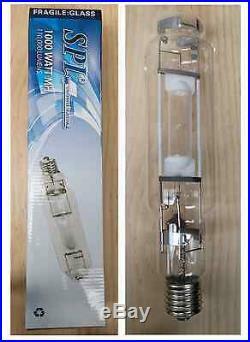 1 HPS + 1 MH Bulb. 1 COOL TUBE HOLD Reflector. 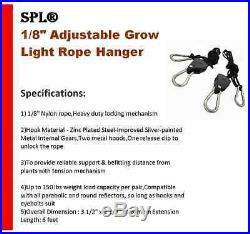 FREE: 1 Heavy Duty Grow Light Flexi Ratchet Hangers 2 24hr mechanical timer. 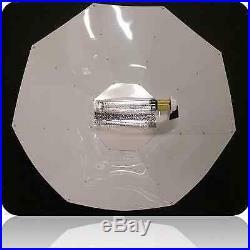 42 inch diameter 8pieces aluminum parabolic reflector. Pre-wired lamp socket and 15ft cable. Made of white aluminum , vertical socket version. Power Supply Frequency: 47 63 Hz. Operating Frequency: 25 100 kHz. Power Factor: > 0.97. Total Harmonic Distortion (THD): < 10%. Crest Factor: < 1.7. Open & Short Circuit Protection. Available in 1000W, 600W, 400W. Color temperature (K): 2,000. Expected Life Span(Hr): 24,000 32,000. Bulb orientation: vertical & horizontal. Available in 1000W, 600W & 400W. Color temperature (K): 6,500. Expected Life Span (Hr): 10,000 15,000. Otherwise, we can't guarantee your item is still available. Please confirm your address is correct. It takes more 2 or 3 weeks to receive items in South America, Russian Federation. If you received wrong item, please let us know. 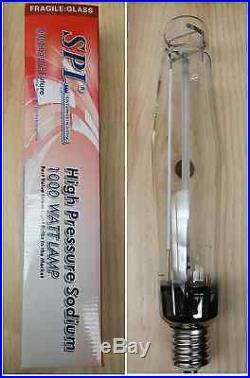 High Pressure Sodium Bulbs - Available in 1000W, 600W, 400W. (Size): 44 1/4" x 10". Digital Dimmable Ballast - Available in 1000W, 600W, 400W. 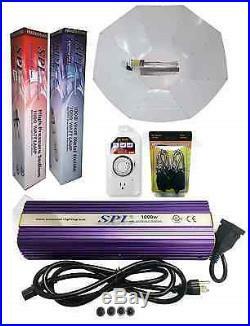 The item "SPL 1000W 600W 400W Watt Parabolic Reflector Grow Light System Set Kit Umbrella" is in sale since Wednesday, August 26, 2015. This item is in the category "Home & Garden\Yard, Garden & Outdoor Living\Gardening Supplies\Hydroponics & Seed Starting\Grow Light Parts & Accessories". 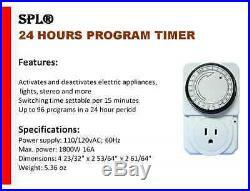 The seller is "splusa2530" and is located in Monterey Park, California. This item can be shipped to United States.